Following in the footsteps of AT&T and Sprint, Verizon today announced a promotion to expand the amount data available through its MORE Everything plans. 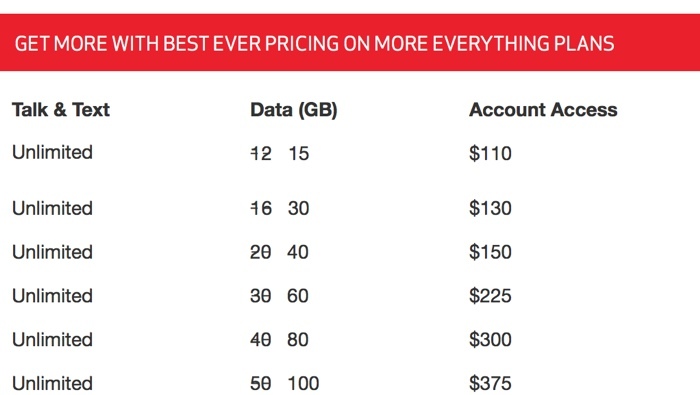 Customers on the 12GB plan will now get 15GB of data for the same $110 per month, while customers on the 16GB plan will now get 30GB of data for $130. Verizon has increased available data across the board, delivering up to double the data for consumers at no additional cost. "We know that no matter how much data you have, it's only as good as the network it's on, and Verizon Wireless' network is second to none," said Ken Dixon, chief marketing officer at Verizon Wireless. "We know our customers -- from families to businesses -- crave more data to help them keep up with their busy lifestyles, and these new promotions, together with other offers like our industry-leading trade- in program, give them even more during the month of October." Customers will be able to get the expanded MORE Everything plans beginning on October 2, with customers able to sign up through October 31. Please stop leaving two line families in the dust. We like deals too. It's just mind-boggling how overpriced mobile data is. Period. When do you think that bubble will burst? Remember when texts used to be like $0.50? I know that the cost on texting is essentially zero since it piggybacks on the tower ping, but there's got to be a point where data becomes reasonable. Of course I also predicted nobody would ever pay $1.29 for water in a cheap plastic bottle. However, you can buy bottled water for 10-20 cents/bottle at a big-box store. We reuse the bottles and refill them from a reverse osmosis filtration system. My hubby will only drink bottled water. I've been refilling them from the kitchen tap for years. He's an idiot just like all bottled water aficionados. How about just dropping prices all across the board and start users at 5 gigs. Also, 3GB extra (from 12GB to 15GB) is technically not "doubling". Doesn't seem like 1 or 2 years ago I was paying Verizon almost $90/month for 2GB of data for my iPhone (that I couldn't tether with), and then paying them another $30/month for 2GB of data for my iPad. So $120 for 4GB of data. Nowadays, $115 gets 15GB of data? Looks like the bubble has already slowly started to burst.